When money is tight, you’re often shoehorned into buying the cheap version of the item. While this solves the problem in the short term, what you’re usually doing is just kicking the can down the road six months or a year or two years or whatever until that version you just bought wears out and then you’re back to where you started. On the other hand, if you spent a lot and bought a reliable version up front, that cycle gets much, much longer. It becomes a matter of five years or 10 years or a lifetime before you have to even consider replacing the item, and it does the job well, too. Yet, when you’re on a tight budget, that high-quality, reliable version of an everyday item is just out of reach, or else it just seems like a frivolous purchase, even though the total cost of ownership is lower over the time you’re using the product and it’ll save you time and headache dealing with a failing item and replacing it down the road. I’ve been there, and it’s rough. You’re trying to keep your spending low, but when you do that, you end up buying cheap items that end up costing you more down the road. Sometimes, you’re basically forced into that situation. I like to put it like this: Sometimes, people can’t afford the low cost of ownership items. That seems strange, but the issue is that items that have a low cost of ownership are often items with a big upfront cost, and people often can’t afford that upfront cost. An $18 pair of socks might last for years and years and years and it’s very likely that such a pair will end up costing you less than buying bags of cheap socks, but it’s $18 for a pair of socks. There is a road out, however. Here are several things you can do to help break out of the cycle of buying cheap versions of the items you rely on so that you can get reliable ones that won’t fail constantly. Read the while article for the advice. And remember, no one cares what you spend on anything except for your financial partner. Don’t argue yourself out of a sound financial decision because of what you think “they” will think, whomever “they” are. 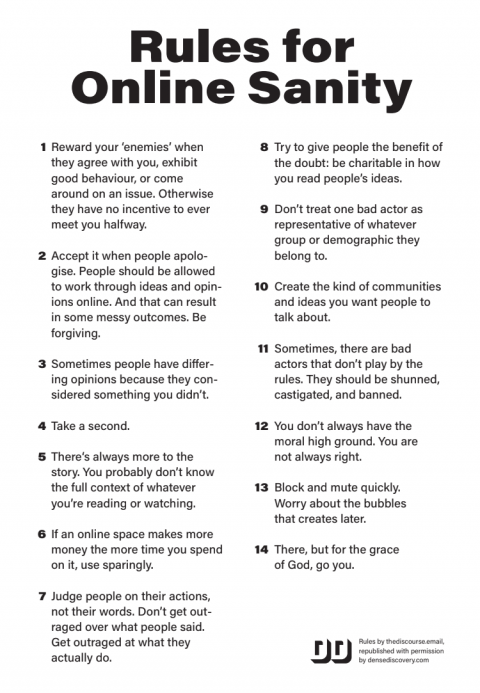 Loving these rules for Online Sanity put together by Kai Brach. If you’re not subscribing to his newsletter Dense Discovery, you’re missing out. Super thoughtful and full of delight. Here’s the newsletter I found this gem in. Other than #6, these apply to life and work and being. Drop the “online” reference from #2 and you have a decent set of communication precepts. Every time Apple introduces a new model of iPad, that old, nasty, stupid, pointless debate rears its ugly head. I’m referring of course to the Can this iPad replace a traditional computer? debate. Also known as Can the iPad become your primary, or even sole computer? Also known as Can the iPad be used for Serious Work? The constant in this debate is the attitude of the two main user groups involved, as each seems to hold this position: My way is the right way, and you’re a fool for thinking otherwise. Now, my decades-old habits, my work-related needs, but also my personal preferences put me in the Mac OS / traditional computer group. The way I organise my workspace, the way I multitask, my need for lots of screen real estate, make Mac OS the ideal environment to work in. But I’ve been using iOS and iOS devices for a long time as well. I can appreciate that some people have managed to make them their primary platform and device. I know that Serious Work can be carried out on an iPad. It really, ultimately depends on what you do for a living. The point that some iPad die-hard fans seem to miss is that it’s not a matter of people not wanting to adapt to an iOS-based workflow; it’s not a matter of people lacking mental agility to ditch their computers and switch to iPads for work. It’s that their work imposes different solutions, in the form of dedicated software, company-issued computers, multitasking requirements (e.g. ability to monitor more than three applications simultaneously on a bigger screen), etc. Amen! I grow weary of this ever intensifying debate around iPad versus Mac/PC. My take: I need a toolbox with a variety of tools (or golf bag full of clubs, if you prefer a sport metaphor) that I can use depending on the work and in what context. I’m not going to arbiltrarilly limit myself. Ramen, like sushi, is a Japanese food that needs no explanation. Typically enjoyed by locals as an easy dish on the go, the old bowl of soup n’ noodles is making quite a resurgence with trendier food-obsessed tourists. Sure, we all know that Ichiran restaurants are great because you don’t have to look at anyone while you’re making a soup splashing mess. And, yes, popular Afuri is worth lining up in the rain for at least once—but if you’re only about the ramen, you’re missing the many more incredible Japanese soup + noodle combos that the country has to offer. Here are just some of the best. I will sample more of the other options this weekend. There’s the Nabe Festival at Hibiya Park and the Soba & Sake Festival at Yoyogi Park. In our attempts to influence others, we often overestimate the effects of what we’re going to say and underestimate the effect of consistent thoughtful action. The Commission is focused on identifying and managing cybersecurity risks and ensuring that market participants––including issuers, intermediaries, investors and government authorities––are actively and effectively engaged in this effort and are appropriately informing investors and other market participants of these risks. The SEC’s jurisdiction covers a considerable range of cyber-related issues. This post tracks the commission’s strategy for incentivizing investment in cybersecurity defenses by mandating disclosure and imposing liability on the victims of data breaches. Recent SEC activity suggests that this is a direction the agency is headed in, particularly with little sign of cybercrime slowing anytime soon. The SEC then went on to identify several specific areas that require disclosure of cyber-related information, including investment “risk factors,” the business’ description of itself, disclosure controls and procedures, among others. The SEC later affirmed the importance of these guidelines in a 2014 roundtable event convened shortly after the release of the NIST Cybersecurity Framework. At that event, SEC chairwoman Mary Jo White stated: “The SEC’s formal jurisdiction over cybersecurity is directly focused on the integrity of our market systems, customer data protection, and disclosure of material information.” Following the roundtable, the SEC’s cybersecurity oversight principally consisted of issuing further guidance documents, risk alerts, and, in some cases, directing companies to disclose information on specific cyberattacks in comment letters. [T]he Commission incorporates cybersecurity considerations in its disclosure and supervisory programs, including in the context of the Commission’s review of public company disclosures, its oversight of critical market technology infrastructure, and its oversight of other regulated entities, including broker-dealers, investment advisers and investment companies. Then a few days later, the SEC announced the creation of a Cyber Unit within its Enforcement Division; the new unit would be tasked with “targeting cyber-related misconduct.” Outlining the Cyber Unit’s priorities in a speech, a SEC official explicitly pointed to “requir[ing] registered entities to have reasonable safeguards in place to address cybersecurity threats” and “cases where there may be a cyber-related disclosure failure by a public company,” among others. Since the creation of the Cyber Unit, the SEC has brought two enforcement actions against victims of breaches. The agency also recently issued a substantial report suggesting future enforcement against victims of breaches that are not in compliance with certain safeguards. In April 2018, the SEC announced its first-ever enforcement against a company for a failing to disclose a breach. In 2014, Russian hackers stole the personal information for more than 500 million accounts from the company formerly known as Yahoo. But Yahoo did not disclose the breach until two years later, when it was in the process of closing the sale of its operating business to Verizon. Meanwhile, Yahoo made no mention of the breach in its SEC filings. The commission found that Yahoo’s statements violated both statutes and regulations requiring the accurate disclosure of “material” information. Yahoo ultimately agreed to a $35 million fine. In September, the SEC brought another first-of-its-kind enforcement action. This time, the agency found a financial firm in violation of a rule that it had never enforced before that requires investment firms to maintain an up-to-date program for preventing identity theft. The order outlined a phishing scheme in which attackers impersonated the firm’s contractors over a six-day period in 2016 and convinced employees on the firm’s support line to reset certain passwords. The hackers then used the new passwords to gain access to the personal information of 5,600 customers. Even though the firm did have some protection in place, the SEC found them inadequate, in part because in two instances, the malevolent actors called from phone numbers the firm had previously associated with fraudulent activity. The SEC ultimately found the firm’s conduct so egregious that it deemed the violation “willful.” The firm agreed to pay a $1 million settlement. Jack Goldsmith and Stuart Russell note in a recent Hoover essay that there has long been skepticism of the regulation of digital networks in the United States. Indeed, many attribute this lack of regulation to the U.S. technology sector’s extortionary record of innovation. But as a greater volume of sensitive information is stored online and, in turn, stolen,, the pendulum may be shifting in the other direction. Especially in the absence of new legislation from Congress, the SEC seems determined to put cybersecurity on the agenda of the nation’s corporate boardrooms. You could waste a lot of time looking for the right productivity app. There are over 19,000 productivity apps in the iTunes store, and endless recommendations of apps that promise to magically give hours back to your day. But here’s the thing: switching between apps all day long is actually the enemy of productivity. Researchers have found that the average worker toggles between apps 10 times every hour. With each context switch, there’s another possibility of distraction. And after each distraction, it takes on average (pdf) 23 minutes and 15 seconds to truly get refocused on the task at hand. So how might workers keep productivity software as a tool working for them, rather than the other way around? We spoke to three productivity app founders to find out. What makes Apple Pay Suica a success? It is a unique layering of hardware and software that tightly integrates into a single seamless experience. At the core is the basic Suica IC card format and the transit gate system technology created by JR East and Sony in the 1980s to solve a user experience problem with magnetic commuter pass cards. Successive layers were added over time: e-money, nationwide Transit IC card interoperability, and perhaps most important of all, Mobile Suica. The Super Suica additions will further enhance the fundamental technology in 2021. Apple Pay support arrived in October 2016, global FeliCa was added in 2017. These were 2 layers from Apple that fit perfectly and extended the entire platform with a whole new ease of use service level. The result is a service where each layer builds on and enhances the whole. This is Steve Jobs 101: work from the user experience back to technology so that the total experience is greater than the sum of the parts. Apple Maps Japan is a classic ‘the total is less than the sum of its parts‘ product. To be sure there are some good parts, but in Japan they don’t add up. The different layers stay separate and never integrate into a seamless whole like Apple Pay Suica does. It’s great that Apple is making process with its map reboot effort in America but the real test will be how well they integrate it all. Superior focus and integration is the only way Apple can close its map gap with Google. I have a Latex setup for my Emacs and org-mode but never have a need to use it. If you have a need for this setup, give this a read. If you’ve tried and failed, check out the last section of the post.